Easy. Spicy. Delicious! 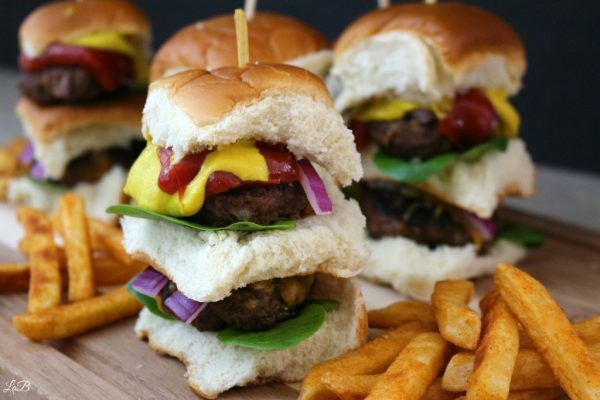 Sliders all around, stacked high and slathered with ketchup and mustard! 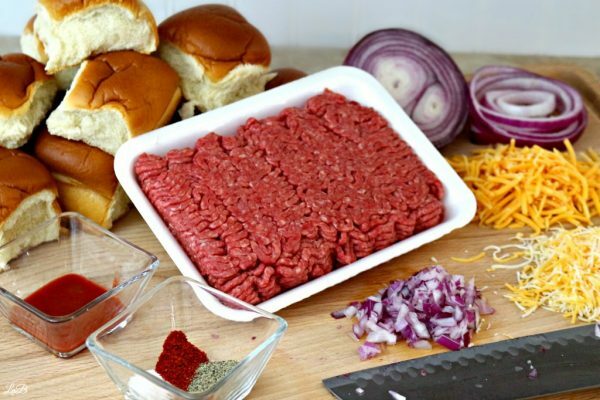 I like to make spicy burger sliders, loaded to the tilt with deliciousness for the whole gang on race day, and I’m going to share my recipe here today. Watching Ty Dillon race for the flag is always exciting, and we all need exciting food to cheer on our favorite drivers, right? Gather around the TV to watch the cars run the track, coming up we have the Duck Commander 500 on April 9th where you can look for Ty Dillon racing for the checkered flag in the Nexium car and later in the year look for him driving a car sponsored by Advil! 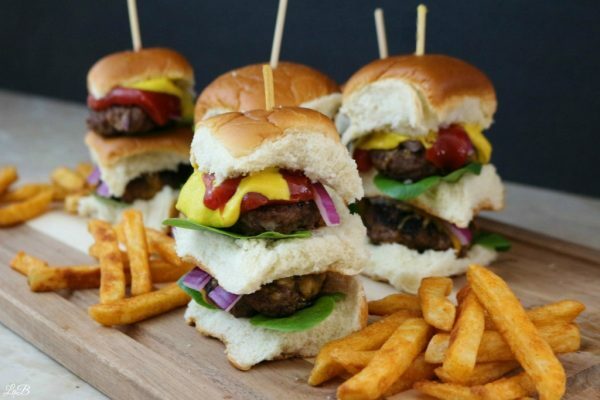 Regardless of which race is your favorite, you’ll need some fan favorite foods to serve during the race, and these spicy sliders are the perfect choice, so lets get to it! 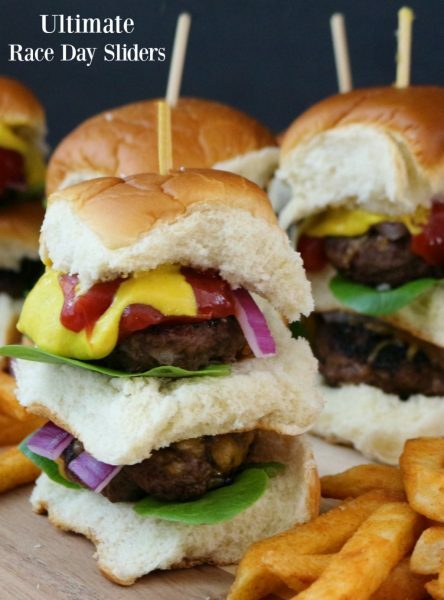 Grab your ingredients for your ultimate race day sliders and let’s get cookin’! If you’d like the printable version of this recipe, you can find it by scrolling down. 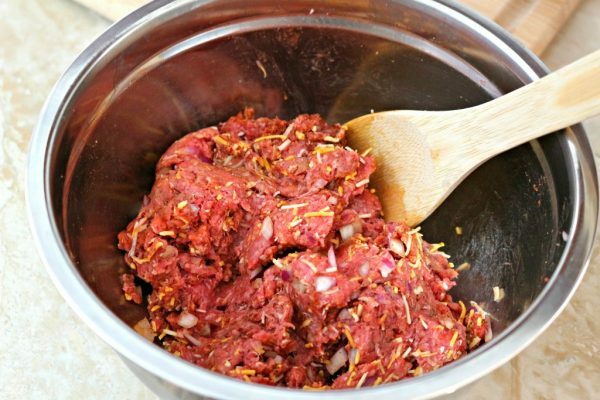 Mix your beef, onions, Mexican cheese and spices in a big bowl. Dig right in with your hands, or do what I do and use a sturdy spoon and a ‘pressing’ motion to mix all the ingredients together. Don’t forget to prepare your favorite french fries before making your burgers, the burgers don’t take very long to prepare. So, get your fries on while you’re preparing your sliders. Form your slider patties, you should be able to get about 10 patties out of a pound of beef. I like to form my sliders, then poke a hole in the center of them. This helps them cook evenly. It also reduces the chance of them turning into meatballs on your grill or pan. You know what I mean, when the burgers puff up like a meatball and need to be deflated! 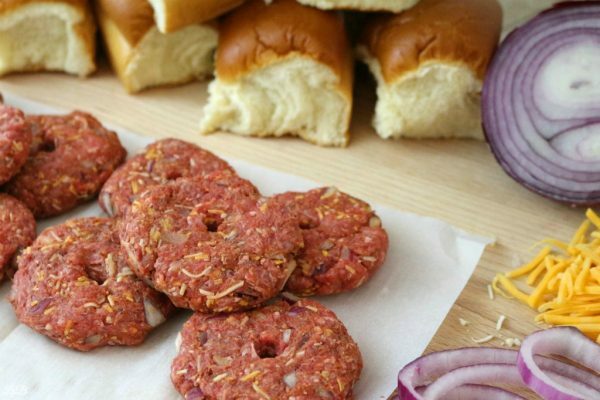 Toss them on a preheated grill or skillet and get cooking. Cook them to your desired doneness and toss the cheese on to melt. Assemble your sliders by stacking lettuce on the bottom half of the bun, followed by the slider and onion on top of that. 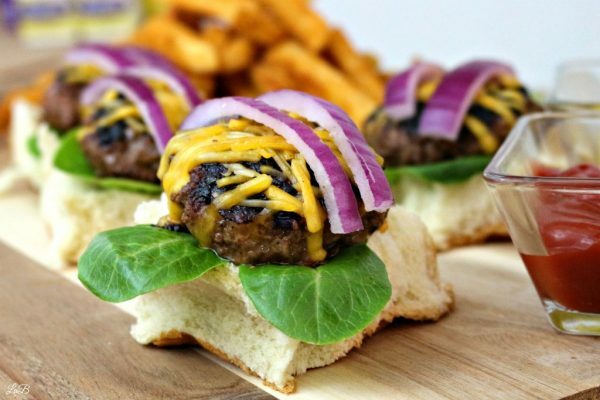 Place another bottom bun on top of the burger with the bottom side down, add more lettuce, another slider, onion, slather ketchup and mustard on the slider, add a top bun and spike it with a skewer. Serve with a side of fries. Place lettuce, and slider on bottom bun half, top with onion, add second bottom bun, face side up, add lettuce, slider, onion, top with ketchup and mustard and bun top, spike with skewer. Print out the recipe to prepare for your race day celebrations. Nexium 24HR is also a great way to prepare for race day. There’s nothing worse than a painful bout of heartburn, especially when you’re trying to enjoy the race! 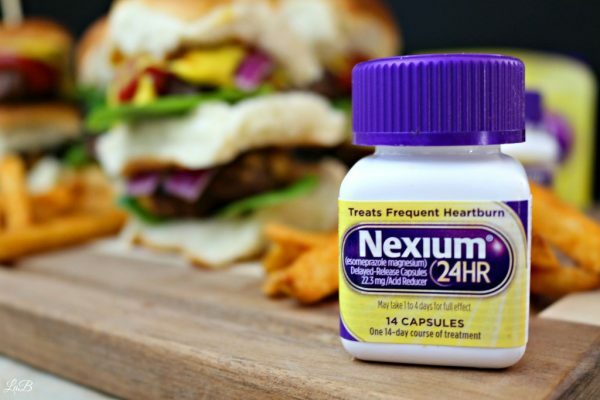 Nexium 24HR, the new #1 selling frequent heartburn brand* *Based on IRI sales data 52 weeks ending 11/1/15 among OTC brands. If you get frequent heartburn, you can turn to Nexium 24HR. All day, all night frequent heartburn protection. May take 1 to 4 days for full effect. Use as directed for 14 days to treat frequent heartburn. Do not take for more than 14 days or more often than every 4 months unless directed by a doctor. Not for immediate relief. Don’t forget to check out the new, easy to swallow tablets, you can find these along side the capsules at Walmart! *Coupon Alert* Get a coupon here. Don’t let frequent heartburn sneak up on you! Don’t let it ruin your race day celebrations and keep you from chowing down on amazing food! 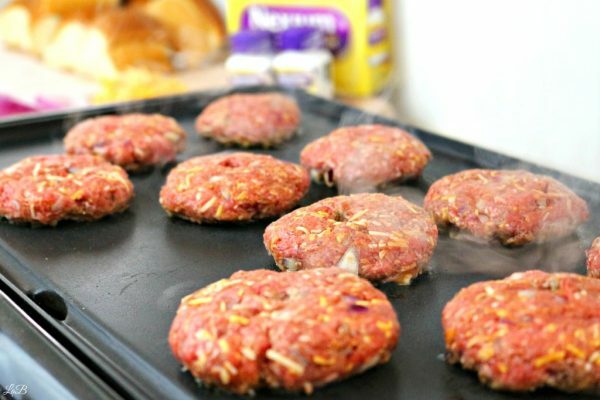 Be prepared for race day with spicy sliders and Nexium 24HR! How do you prepare for race day?